Will Arsenal Fans Finally See The Best Of Tomas Rosicky? Theo Walcott’s hat-trick against Blackpool on Saturday assured that the young winger would grab the majority of the headlines, and rightly so, but Arsenal’s demolition of Blackpool was far from a one-man show. Pulling the strings quietly and with an elegance and vision which seemed to had vanished last season after 18 months robbed to injury was Tomas Rosicky, or ‘Little Mozart’ as he is affectionately known in his native Czech Republic. Rosicky’s link play with Andrei Arshavin and Theo Walcott was a joy to behold and, regardless of the quality of opposition, the Arsenal number 7 gave a masterclass in the ability to find pockets of space between the midfield and defence. Arsenal seem to have gathered a plethora of diminutive playmakers all wanting to play in the ‘hole’ behind a target man. It is a position Cesc Fabregas often finds himself pushed into as the season progresses, Arshavin would ideally love to play there, but Wenger prefers to use him on the left, and it is also the position Samir Nasri feels is his most natural. Nasri auditioned well for the role at Anfield last weekend but the Frenchmen seemed to hold onto the ball for too long at times and, while his constant movement caused Liverpool problems, he often left Marouane Chamakh isolated against Jaime Carragher and Martin Skrtel. Where Rosicky excelled on Saturday was in his ability to always receive the ball on the half-turn, ready to move the ball forward and always aware of his options. He also kept the play ticking over when he needed to and was efficient in his time on the ball, refusing to over-elaborate. With the likes of Rosicky, Nasri, Fabregas and Arshavin at the club, there is certainly no better place for Jack Wilshere to learn the trade. Rosicky has endured a difficult time since signing for Arsenal in 2006 to replace Robert Pires, who departed for Villarreal. With Arsenal playing a 4-4-2 formation, it meant that, instead of playing in a attacking central role, Rosicky had to adapt his game to play on the left side of midfield and contribute defensively as well as going forward. Replacing Pires was always going to be a difficult task and adapting to a new league and new position at the same time affected the Czech captain’s form. There were glimpses of his potential during his first season including a 30 yard screamer against Hamburg and two excellent strikes against Liverpool in the FA Cup at Anfield. The first half of the 2007/2008 season saw the former Dortmund captain start to flourish in an Arsenal shirt and playing alongside his best friends at the club, Fabregas, Alex Hleb and Mathieu Flamini, the ‘Four Musketeers’ helped Arsenal make a real fight for the title. However, Rosicky came off injured against Newcastle United in January 2008 with what seemed a routine hamstring injury and was left sidelined for the next 18 months. The injury was complex and at more than one point it seemed his career was on the line. After finally getting fit last season, Rosicky made 33 appearances for Arsenal and made a return to the Czech national team, however his form was erratic and it was rumoured he could be heading out of the Emirates this summer, despite signing a two year extension to his contract in January. A full pre-season has given Rosicky a solid base to build from and it seems he is reaping the rewards. It may be premature to say he his back to his best but he was Arsenal’s best player at Anfield after coming off the bench in last weekend’s 1-1 draw and his performance against Blackpool will give Wenger a selection headache now that Fabregas has returned to fitness. That the Arsenal captain will come straight into the side is in no doubt, but Wenger may now be more inclined to play Fabregas in the deeper midfield role currently occupied by Wilshere, rather than ousting Rosicky. Whatever Wenger decides to do, it is great to see Rosicky back fit and playing something like the kind of football which made him one of the best midfielders in Europe not so long ago. Hope so, he really is a huge boost for the club, practically a new signing. Can’t wait to see him tear it up some more. Yes! At least someone else noticed how well he played. His touch, his passing, his vision it was all perfection. That was the guy we signed, that’s guy we almost saw many moons ago! I hope he stays fit and I hope he keeps his place in the side. I want Jack to do well but Rosicky looks like he’s holding all the keys to each defence this season. Please stay fit Tommy and do the number 7 shirt proud!! He did indeed look better than Nasri. Elsewhere in our midfield, I was glad to see Diaby improve in the Blackpool game. His passing was certainly subpar at Liverpool and he left the back 4 out to dry too often for someone who had been asked to take on some of Alexander Song’s defensive responsibilities. “absolute class” tomas was sensational on saturday, truely a great player worthy of the no.7 shirt at arsenal ,just wish he would shoot more. personally I don’t think it will continue, but it would be nice to see the player come to the form that he’s been promising all this time. Wenger has got a gift for nurturing young talent. Rosicky was class way before he came to Arsenal. He didnt just become good, Wenger bought a seasoned international. Injuries robbed him of his abilities. If he stays fit it WILL continue. He played not more than 30 minutes in liverpool game. It was the best attacking movement when he shot and riena saved it. He is technically superb! I hope so. Boy is good. i like his style deliver at the moment… at least u all who not like tomas can see his performance near his best form. and he get back confidence to deliver.. keep perform tomas……..
Well looks like he is gaining confidence after the injury but getting the best off him will come down to more minutes and Arsenal’s general performance. Well written article. 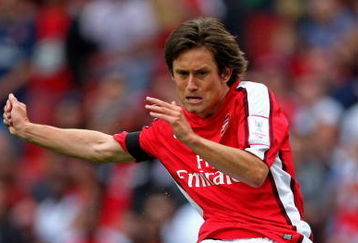 I’ve always been an admirer of Rosicky’s talent. There’s something so unique n stylish about his passing style. He has a plethora of passing styles always possessing a mental precision, timing accuracy in conjunction with the instinctive midas touch on d ball dat often times gets the pass spot on. I said it before pre-season, Tomas Rosicky will be our key asset in opening up the big teams with his excellent work rate and ability to see things Nasri, Wilshere and Arshavin wouldnt. Now we are signing squillaci maybe the Verminator can play a holding midfield role and Kosielny and Squillaci can hold the centre of midfield. It would give Vermaelen a chance to really use his shooting boots more often. Mini Motzart will produce if he stays on the field healthy and fit!!!!! Can someone explain why commentators pronounce his name dfferently? My limited language skills lean towards the first, but I hear the second more often from the commentators. I am all for ‘lingua franca’, but can someone clarify please? Id say it like the second one I put, that would be what people more often. Some commentators try to sound smart but they’re not, for example Mick Macarthy kept calling Raul Meireles MA-RELSH when it is clearly Ma-rer-les. Hope this helped. I recently met some folks from the Czech Republic who had no idea who I was talking about when I said row-SICK-ee (like we here him called on the telly)… they assured me the Czech way to say it is row-ZITS-key. However you say it – he’s brilliant when healthy – which leads me to a question I’ve been pondering… on the chance we’re a healthy club by the New Year, we’re going to have significant issues with which stars get the seven substitute spots for top-flight ties. Assuming the Squillaci deal is finalized and we bring in another keeper (I’ll assume Schwarzer here) by next Tuesday, I’d name a starting 11 as follows: Schwarzer, Clichy, Vermaelen, Squillaci and Sagna across the back, Song at holding mid, Arshavin at left wing, Nasri and Fabregas in the engine room, Wallcot down the right, and v.Persie as striker. If Schwarzer is signed I’ll further assume Almunia leaves ensuring one of the seven pine-riders would have to be Fabianski. With only the six outfield positions left – there will be major talent and regret on in the stands behind the players’ bench. I’d assume three of those spots for cover across the back with Gibbs, Koscielny and Eboue – who offers further cover on the right wing – all dressing. Up front either Chamakh or Bendtner will spell v. Persie and I’m anointing Chamackh with the hope he lives up to his potential (and to save me from breaking yet another big screen television in frustration at Bendtner’s wastefulness). Now we’re left with two seats for impactful substitutes with Ramsey, Rosicky, Diaby, Denilson, Bendtner, Vela and Wilshere (not to mention Djourou and Trarore) vying for first-team action. I think Ramsey and Rosicky are the natural options here but that leaves Song as the only man on the team sheet capable of anchoring up in front of the back four. My biggest regret is actually Vela, who I think could be a real star – but he’s just not going to find a place in the current squad. Diaby, Wilshere, Denilson, Bendtner, Vela, Djourou and Trarore in the stands is a nice problem to have but Arsene will have his hands full keeping them all happy. ROSICKY IS TOP CLASSS, i hope he stays in the lcm floating position hes brilliant on the ball, and every-time he gets it u know hes ready to create a problem for the opposition, i believe that nasri should move to the flanks and let fab + rosicky play in the central role, song as holding and arshavin on he left. IF ARSENAL CONTINUE LIKE THIS THE EPL IS OURS !!! !